Home Cervelo P2. Great time trial frame from Cervelo bikes. Cervelo P2. Great time trial frame from Cervelo bikes. The Cervelo P2 frame when built up with some Zipp wheels makes a super fast time trial bike. for the latest tips and advice on training for cycling events. 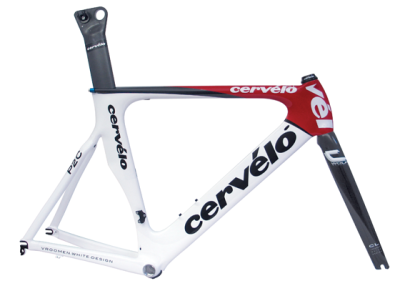 The Cervelo range of P2 frames are fantastic superlight and aerodynamic time trial frames.The 2008 model is available in a white and red colour and the 2009 in grey and red.The frame comes supplied with an aero seatpost. All you need to complement the frame are a set of super fast Zipp wheels, with siome Vittori crono tubulars and you can watch as your time trial times tumble. See photo of 2008 P2 frame below. For the best deals on Cervelo bikes and frames including the P2, we recommend Slane Cycles at www.slanecycles.com.Alternatively you can contact them on 02890 600040 for further information and advice on these frames and suitable components to help you go faster. From Cervelo p2 back to make a web page section. Return to home page of the Belfast Northern Ireland website.